As my previous posting indicated, I am a huge fan of SOUTH PARK. Not every episode hits the mark, but those that do tend to leave an indelible impression. Yesterday our Supreme Commander-In-Chief released a 35-page rationalization for our continued invasion and occupation titled "National Strategy for Victory in Iraq." 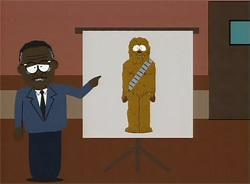 It reminded me of the "Chewbacca Defense," a now-famous, all-too-often-used tactic which had its debut in Episode 27 during the second season of my favorite animated television series. For those of you who missed this airing or who may be unfamiliar with this expression made famous by SOUTH PARK creators Matt Stone and Trey Parker, let me explain. The "Chewbacca Defense' is a satirical term for any legal strategy or propaganda strategy that seeks to overwhelm its audience with nonsensical arguments as a way of both confusing those standing in judgement and as a way of drowning out legitimate opposing points of view. It is thus a kind of logical fallacy similar to argumentum ad nauseam. It could also be described as a "straw man" argument. "Ladies and gentlemen, this (pointing to a picture of Chewbacca) is Chewbacca. Chewbacca is a Wookie! But Chewbacca lives on planet Endor. Now, think about that. THAT DOES NOT MAKE SENSE! Why would a Wookie -- an eight foot tall Wookie -- want to live on Endor with a bunch of two foot Ewoks? That does not make sense! ...Ladies and gentlemen, I am not making any sense. None of this makes sense! And so you have to remember, when you're in that jury room deliberating and conjugating the Emancipation Proclamation... Does it make sense? No! Ladies and gentlemen of this supposed jury, it does not make sense. If Chewbacca lived on Endor, you must acquit! The defense rests."